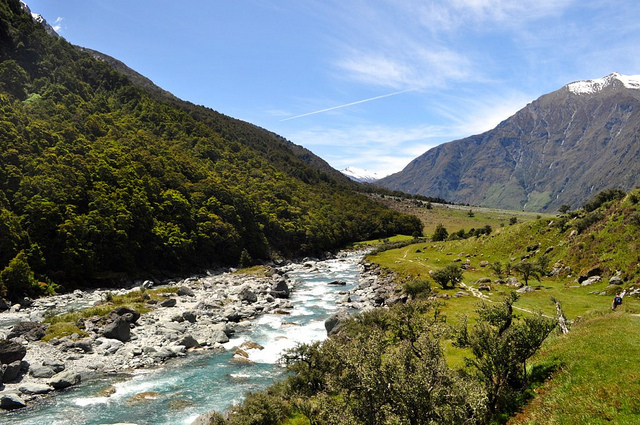 New Zealand is a remarkable country to visit and is home to a wide variety of attractions. Of course, some of the most spectacular sights are natural, so you need to make sure your trip allows a decent amount of time to discover these in all their glory. If you don’t have months on end to dedicate to travelling around New Zealand, your best bet will be to join a small walking tour in New Zealand that can take you to the top spots for hiking and give you a good overview of what the country has to offer – there are some great examples here. To get you in the mood for exploring, we’re going to take a look at some of the places you shouldn’t miss during a trip to New Zealand. As New Zealand’s largest city, you may not think that Auckland is the ideal place to begin a walking holiday, but there are some stunning strolls you can go on that will take you out of the urban jungle and into some of Auckland’s prettier neighbourhoods. One thing you may not know about Auckland is that it’s located in an area with more than 50 extinct volcanic cones and these interesting features make excellent places for hikes. You can climb most of them, but for some of the best views of the city head up Mount Eden which, at 191 m high, is the tallest. As well as views of the skyscrapers and harbours below, you can look down into the 50 m deep crater at its centre. Stay until nightfall to see the skyline light up before your eyes. There are numerous walks you can do between Auckland’s important cultural and historical sites, too, so depending on how much time you want to spend in the city you’ve got plenty of other options for an informative stroll. Rotorua is renowned for being where New Zealand’s geothermal activity can be seen in all its glory, with the Volcanic Plateau attracting visitors from far and wide. Take a stroll through the Wai-O-Tapu geothermal wonderland to see what this place is all about. One of its main features is the Champagne Pool, with its deep green waters in the centre and bright orange shoreline, where you can see the steam rising from the surface. Another must-see is Lady Knox Geyser, which erupts every day at 10.15 am, sending a huge 10 to 20 m high plume of water and steam into the air. The mud pool, where mud bubbles away, is another essential stop. It was once a large mud volcano that was gradually destroyed by erosion, leaving only the pool behind. After discovering Rotorua, you’re just a short distance from Tongario National Park, where you can start doing some serious hiking. This protected area features three active volcanoes and boasts some dramatic landscapes for you to explore on foot. The best way to do so is by following the Tongario Alpine Crossing – a one-day trek that leads you past steam vents, active craters, lava flows, thermal lakes and much, much more. For any Lord of the Rings fans, it’s worth pointing out that one of the volcanoes you can see as you hike is Mount Tongario, which was used as Mount Doom in the movies. Moving on to the South Island now, we come to Fox Glacier which, along with its twin Franz Josef Glacier, flows all the way down from the peaks of the Southern Alps to end around 300 m above sea level. A hike to the terminal face of this vast glacier is a must and what’s truly remarkable is just how close the rainforest is to the mass of ice. The glacier ends in a valley full of plant life, providing a stark contrast to the frozen water and rock that is gradually inching forwards. Wanaka is a picturesque lakeside town that’s a haven for hikers as there are so many walking trails around here. To top it off, it’s also near Mount Aspiring, which is often described as New Zealand’s version of the Matterhorn. There are a host of lovely hikes around the area, including the path that leads along the lake’s shores and up to Mount Iron – a vantage point that gives you 360 degree views of the surrounding countryside. No hiking tour of New Zealand would be complete without spending a few days discovering Mount Cook National Park. This is where you’ll find the country’s highest mountain – Mount Cook, which stands some 3,764 m high. There are dozens of walking trails in the park that allow you to appreciate its mountainous scenery – there are, in fact, more than 200 peaks over 2,500 m high in the protected area. Another sight to look out for is the imposing Tasman Glacier, while the variety of wildlife and plants here is staggering – a fantastic place to explore on foot.